The camera focal-plane shutter is comprised of two curtains: a front curtain that opens to start each exposure and a rear curtain that closes to end it. With the electronic front-curtain shutter, exposure is started electronically after the front curtain opens; exposure ends when the rear curtain closes. Opening the mechanical shutter before the exposure starts eliminates vibrations caused by the shutter, reducing camera blur. Follow the steps below to take photos with the electronic front-curtain shutter. 1 Enable the electronic front-curtain shutter. 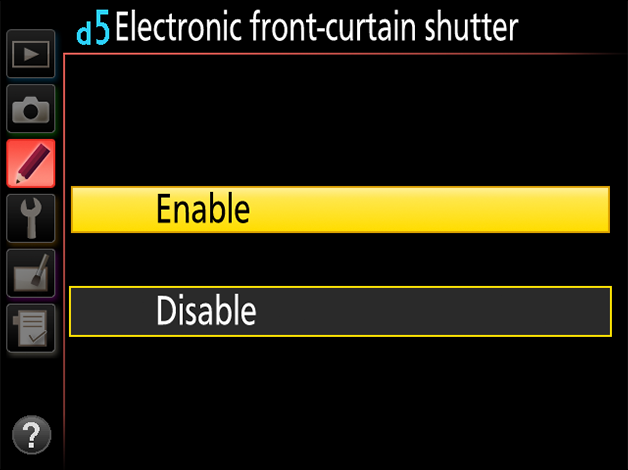 Select Enable for Custom Setting d5 (Electronic front-curtain shutter). the release mode dial to . After pressing the shutter-release button halfway to set focus and exposure, press the button the rest of the way down to raise the mirror. Press the shutter-release button all the way down to take a photograph using the electronic front-curtain shutter. The mirror lowers when shooting ends. Use of a tripod is recommended. To prevent blur, use an optional wireless remote controller or remote cord and release the shutter a couple of seconds after raising the mirror. A picture will be taken automatically if no operations are performed for 30 s after the mirror is raised. When using the electronic front-curtain shutter with a shifted or tilted PC-E lens, adjust settings for a shutter speed slower than 1/250 s. Faster speeds may result in uneven exposure. Camera blur is particularly visible when vibration-sensitive equipment is used for microscope photography or shots taken with a telephoto lens or teleconverter at high zoom ratios, as can be seen below in photos taken with a tripod-mounted AF-S NIKKOR 80–400 mm f/4.5–5.6G ED VR lens. Use the electronic front-curtain shutter in these situations and for high-precision photos of documents and the like. Although exposure delay mode can be used to reduce camera blur caused by the mirror, it has no effect on camera blur caused by the shutter. 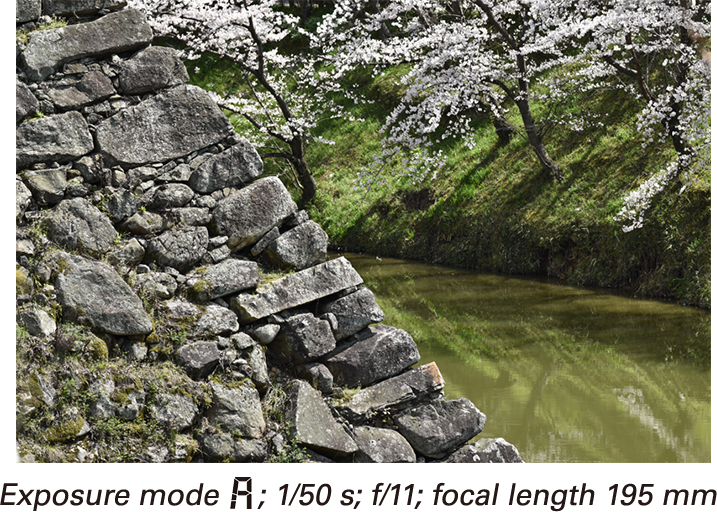 In order to maximize the camera resolution, please also refer to the list of NIKKOR lenses in Aperture and Complex Subjects in D800/D800E Tips. The virtues of the electronic front-curtain shutter become clear when a long lens such as the AF-S NIKKOR 70-200mm f/2.8G ED VR II is mounted on a light, compact tripod (the benefits are even more pronounced if a teleconverter is attached). If the support point is not directly under the camera, the slightest vibration of the camera body will create a seesaw motion. Using the electronic front-curtain shutter in situations like these keeps blur caused by camera movement to a minimum. Long telephoto lenses amplify blur even when mounted on large, sturdy tripods. The electronic front-curtain shutter can be used in situations where in the past one might have needed a lens support or separate tripods for the camera and lens. If the camera is firmly supported directly from below, the slight motion caused by the mechanical front-curtain shutter is unlikely to produce noticeable blur, and the effects of the electronic front-curtain shutter will be difficult to detect. Blur caused by the movement of the mirror can be adequately controlled using Custom Setting d4 (Exposure delay mode) or by rotating the release mode dial to . These options are recommended when a wide-angle or standard zoom lens without a tripod mount is used for landscape photography, as they carry none of the restrictions of the electronic front-curtain shutter, such as limiting shutter speed to 1⁄2000 s or slower or your choice of release mode to . 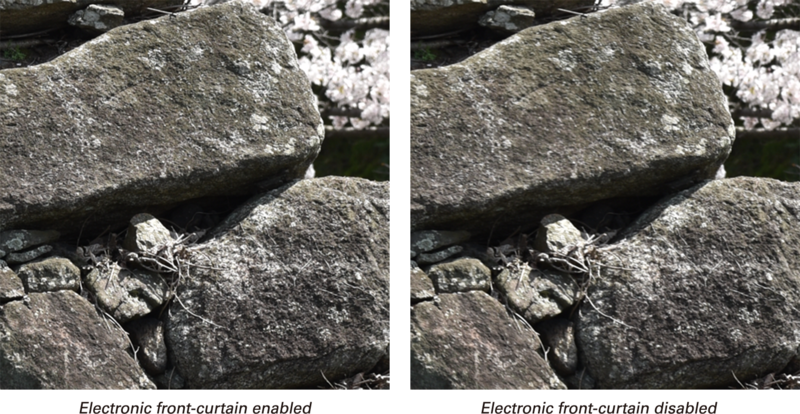 When the electronic front-curtain shutter is enabled, the front curtain is left open and image sensor used to start the exposure electronically, and consequently the shutter does not make a sound when the exposure starts. 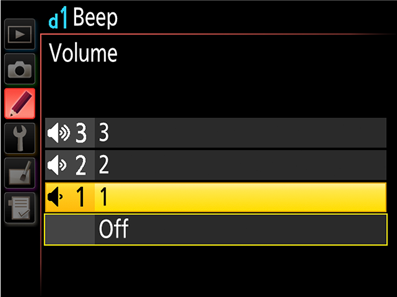 When making long time-exposures and in other situations in which you would like aural confirmation that the electronic front-curtain shutter has opened, enable the beep speaker by selecting an option other than Off for Custom Setting d1 (Beep) > Volume (this setting is not recommended in theaters and other locations where silence is required, as the beep will also sound at other times, such as when the camera focuses).